The rapper was filmed insulting two Alaska Airlines Employees. 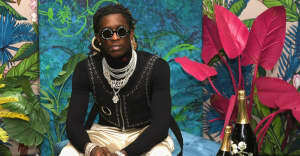 On Thursday, Young Thug was filmed in an airport calling two Alaska Airline employees "peasants," and "ants," and insulting their hair as "nappy." According to HotNewHipHop, the altercation began when Thug missed his flight to a concert in Seattle, and refused to be placed on a partner airline. In a series of (since-deleted) tweets, the rapper said he was not anti-black, pointing at his own skin and that of his family, and that the insults were only directed at "those two black burnt women." This afternoon, Young Thug has posted a series of Instagram videos about the controversy. In the above clip, he accuses his detractors of hypocrisy for attacking him while enjoying violent videos that feature black people. In another video captioned "African-American I am," Thug proclaims "Black Lives Matter forever," but says he chooses to stay out of politics. He goes on to describe his charitable donations to the black community and to Haiti, while insulting unnamed rappers. Watch the videos below. The FADER has reached out for comment.